In a large bowl, toss the strawberries with the sugar, tapioca, and Grand Marnier. Pour into an ovenproof dish. In a separate bowl, combine the brown sugar, flour, oats, and orange zest. Add butter and, using your fingers or a pastry blender, mix to combine so that large pea-shaped pieces are formed. 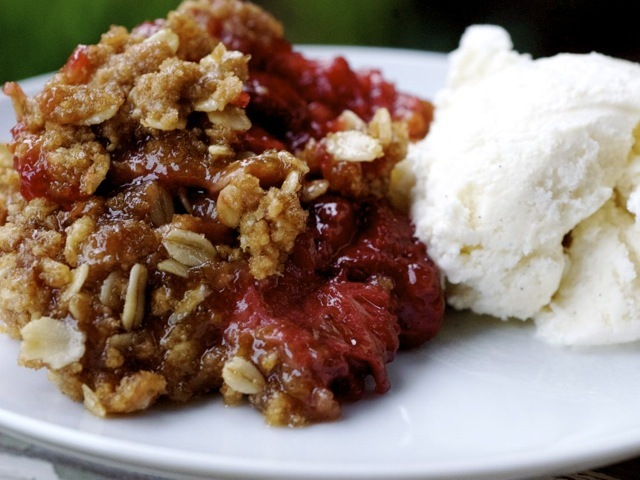 Pour crumble on top of strawberries. Bake until golden brown, about 30 minutes. Serve warm, with ice cream or whipped cream on top. Read more about using frozen fruit in desserts in Keri Fisher's "Frozen assets."